Oh how much has changed since a year ago. In Nashville, my exciting celebrity sightings included waiting in line at Starbucks behind Keith Urban and Nicole Kidman, going to a Colbie Callet concert and standing next to Hillary Scott and Taylor Swift, and catching glimpses of other country music stars around town. Now I run into different kinds of celebrities. A few months ago, I walked out of my office as George W. was walking down the hall. Earlier this week, I went to get a salad and the chief of staff of the army, general odierno, was towering behind me (he didn’t stay in the salad line when he saw the other options…), as his secret service milled around. Not only have my celebrities changed, I have learned a great deal about an institution I knew basically nothing about: the army. As people will quickly remind me, West Point is not “the real army,” but when you are going from no information, you can say my knowledge has increased infinitely. Since many of you also might not know much about the army, I’ll give you a little lesson here. To enter the army, a person can take two routes: enlist for a designated amount of time or commission as an officer. People going through ROTC or West Point are all commissioning as an officer when they graduate. People on the enlisted side can also become an officer by going through OCS (officer candidate school – I think that’s what it stands for). To make things more confusing though, there are a few types of “officers” in the army. There are traditional officers, which are the commissioned officers that I mentioned before. Then there are non-commissioned officers (NCOs) which are on the enlisted side but are more experienced. THEN there are warrant officers, which are considered “experts” in a craft, such as aviation. Confused? Don’t worry… I’m still figuring it all out. What hasn’t changed in the past year, is my favorite chocolate chip cookie. 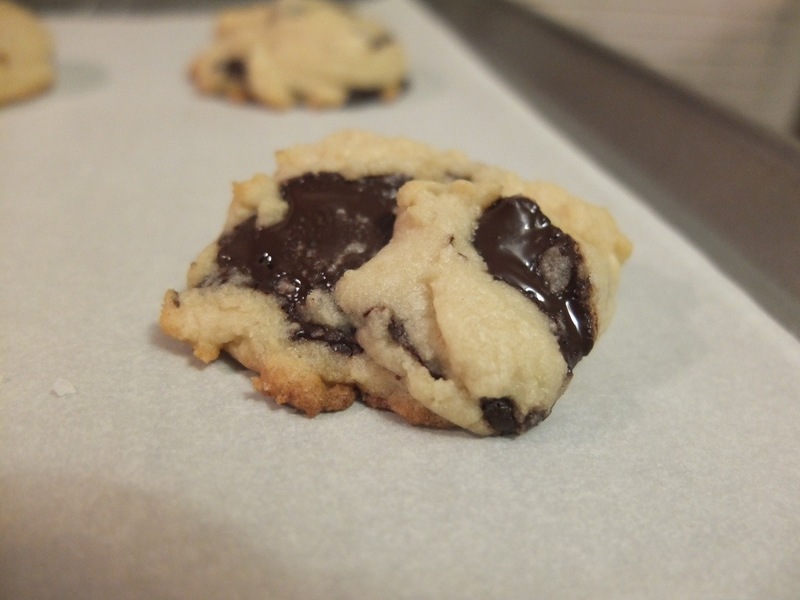 I got this recipe from a Nashville blog before I left, and it has quickly become my go-to chocolate chip cookie. It uses self rising flour which both saves some time because it doesn’t need baking soda or baking powder and it leads to a super fluffy cookie instead of the flat chocolate chip cookies I used to make. I made this batch for one of the NCOs that works in my office who just got accepted to warrant officer training school to become an aviation warrant officer. Quite exciting and pretty cool too. 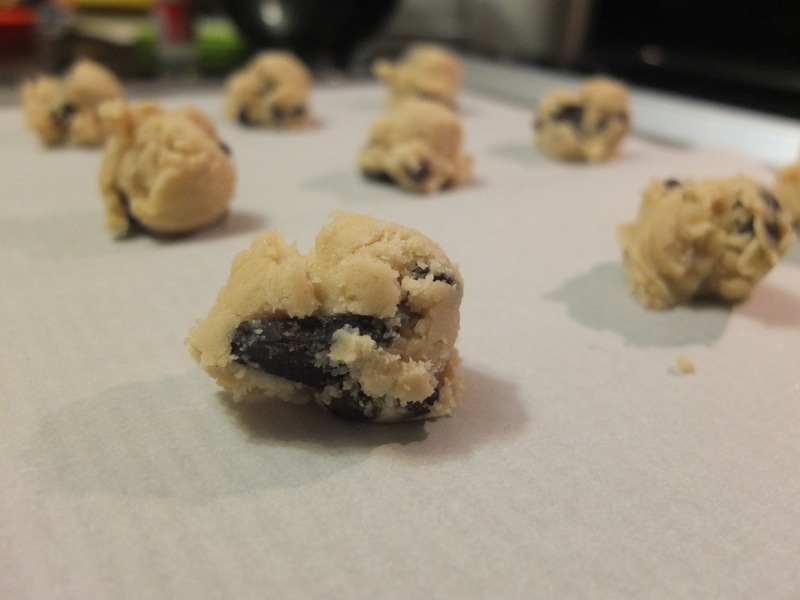 Scoop onto parchment lined cookie sheet in desired sizes. Sprinkle on some additiona sea salt. Bake for 8-12 minutes, depending on the size of the cookie. Sometimes I do huge cookies and sometimes I do mini ones, both are equally as good as long as you take them out when they are slightly browning.